Hi all, we had a busy week last week with the end of mid-week leagues and the always well supported Cobh to Blackrock race. We also saw the launch of the new format for Volvo Cork Week 2018 and the Notice of Race for the CH Marine Autumn Series. I am also delighted to announce that this year for the Autumn series we have teamed up with North sails Ireland and with the ICRA training grant will be running a new train initiative during the series, more details on this will be out shortly. On the 23rd of September, we have our annual Naval race, FG 11.55, hope to see you all out for that. Thanks to my class captains for the reports that follow. Best of luck to Anthony O Leary and his crew competing in the Rolex NYYC Invitational they are currently lying 8th after 6 races. At the Quarter Ton Cup in Cowes Paul Gibbons and crew are currently in fourth place, best of luck to all our members representing the Club overseas. 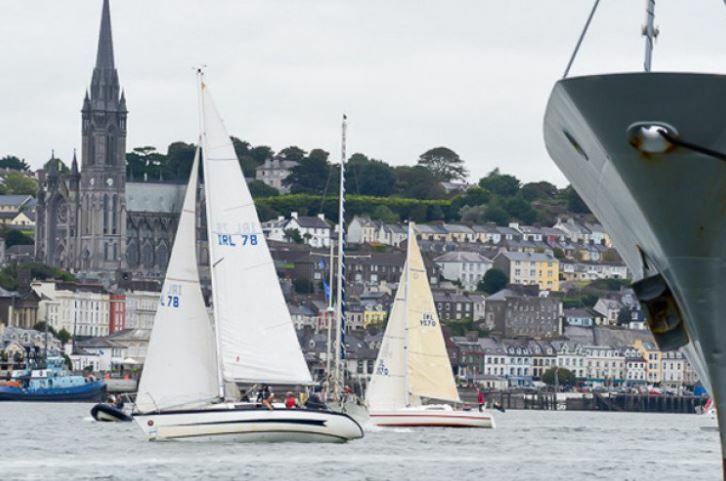 The race on Thursday 7th September was the sixth and final race of the Fitzgerald Menswear August/September series. While there had been some heavy showers earlier in the day, it turned out a lovely sunny evening. 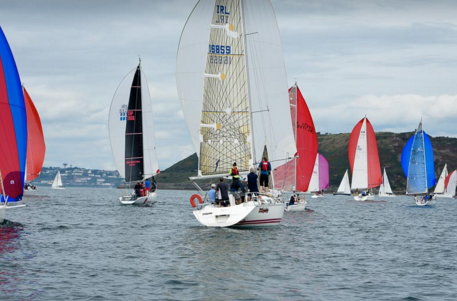 With a 12 to 14 knots south-westerly, the starting line was at Cork Beg. The all-in fleet of 15 boats, very eager to get racing, bunched up at the committee boat end of the line coming up to the start. With nowhere else to go, a number of boats were over the line before the gun and a general recall was signalled. The fleet got away on the second attempted. A brisk beat to the Cage buoy, as the tide started to ebb, was followed by a fast spinnaker broad reach to No 7. Leaving No 7 to port, it was a question of how long one could hold onto the spinnaker, as sheets were hardened to head for No 13. The refinery jetty also came into the equation, leaving little room to run off in the gusts. Most spinnakers were dropped within a short distance. Alpaca was first to No 13 followed by Heroes and Villains, whose asymmetric spinnaker really paid off on this leg, and Ellida. On the beat from No 9 to the Cage, Alpaca held onto her lead, followed by Heroes and Villains. Saxon Senator came through to finish third over the line, followed by Ellida, Tux and Cosmic. The wind turbines were silhouetted in the setting sun as we folded our sails, readied our warps and fenders and motored up river. 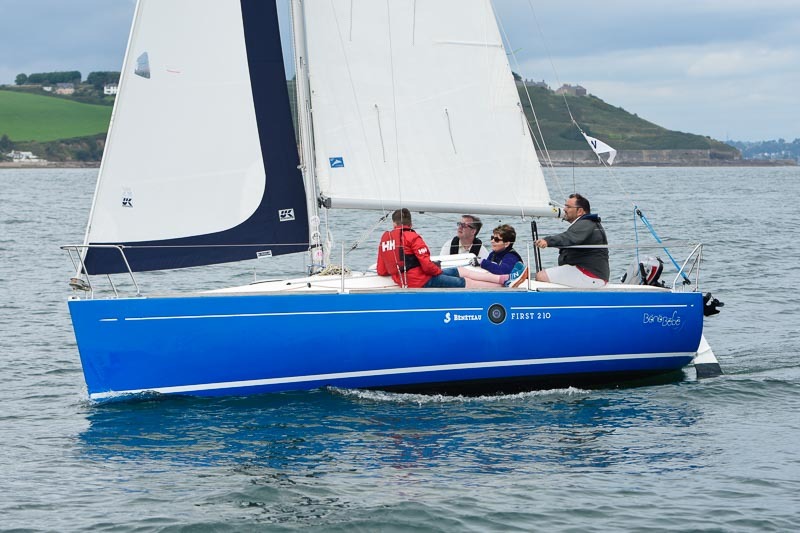 Final Thursday night race of the season – where had the summer gone? On corrected time under IRC, Alpaca sailed by Paul and Deirdre Tingle was first, Ellida (Ria Lyden) second and Saxon Senator (Wan and Eric Waterman) third. Under ECHO, the places were reversed. Eight boats came to the starting line for the final Friday night Fun Racing white sail race of the league. OD was Padraig Byrne, he set a course of No 5 to Port and 2 legs of 101 from the club race card. With winds of 23- 25 kts and gusts of up to 30 kts the fleet rounded No 5 bunched closely. The bigger boats opened up an early lead with Clodagh O’Donovan’s Roaring Forties leading, followed behind by Paul O Shea’s Elegance. Sean Hanly Luas and the Sigma’s of Barry Crockets Upstart and Tom McSweeney Scribbler II fighting for position in the middle of fleet. All crews worked hard in the fresh, but dry and Sunshine evening which made for a greats night racing. 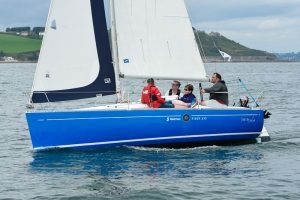 Peter Webster on Thistle was jostling hard at the back of the fleet to fend off the challenges of Simon Brewits Callisto and Tadhg Lynch’s new boat Yasmin. In the end there was only seconds between the 3 boats at the finish line. Paul O’Shea Elegance took Line Honours but on Handicap Peter Webster’s Thistle pipped Elegance by 12 seconds to take first place with Elegance 2nd and Callisto 3rd to end this Seasons racing. The overall results for this month’s league. 3rd UpStart. Barry Crockett . I think all participants would agree that the Blackrock race 2017, Saturday 9th September, was not for the faint hearted. Met Éireann was forecasting force 5 to 6 in the morning, decreasing 4 to 5 in the afternoon. The weather websites generally agreed with the Met Éireann forecast, which is usually conservative for inshore waters, as it is for up to 30 nautical miles offshore. There seemed to be a lot more wind than that on the river, with halyards flapping and in-mast furling systems whining around the marina. For once the headsail choice was easy – the smallest. Twenty five knots met us at the river mouth and there was the odd higher gust motor sailing over to Cobh. 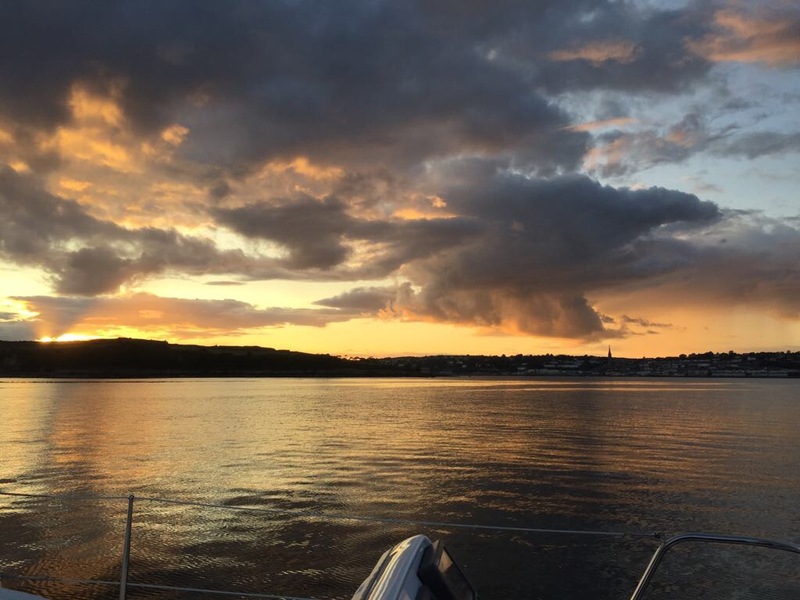 One boat was returning to Crosshaven – hmm, what do they know that we don’t? In the lee of Great Island, the lulls were followed by fierce gusts from various directions, followed by another lull. “Bullets” they used call them in Sydney. The race officer announced that Class 1, 2, and 3 would be the third fleet to start and the course would be eastward to No 13, then No 9 to port, back to No 13 and from there to Blackrock. It was a broad reach to no 13, with a few boats including Saxon Senator, Bad Company and No Gnomes setting spinnakers. Once round No 13, and out from the lee of Great Island, those who held onto their spinnakers got into all sorts of trouble and the rest were steering to avoid them. At No 9 it was “heads down, hold on everyone, gybing”. A short beat north from No 9 got the boats back into the very gusty conditions under Great Island. Then it was long tack, short tack, long tack, along the length of Cobh to the corner at Rushbrook. Altair, Magnet, Bad Company and the others, who stayed on the south side of the channel did better on this leg. They had slightly steadier winds, but as it was low tide, there was not a lot of water outside the channel, which one boat from another fleet found out the hard (soft) way. The squally, fluky conditions continued around the corner and through the narrows of the West Passage. The white sail fleet had started before us and only went as far as No 18 before heading up river. Most of our fleet had worked our way past most of them, by the time we turned the corner into Lough Mahon. It was here that the fun really started. It was a dead beat, at low tide, in 25 to 30 knots. Sailing by echo sounder only: “ 8 – – 9 – – 8 – 7.5 – 6 – 5 – tack – 4.5 – 6.5 – 7.5 – 8 – – – 8 – 7 – 6.5 – 5 – tack – 5 – 6….” and so it went on, for tack after tack after tack. Catching up with and getting past a white sail boat meant a few anxious minutes until the way was clear and then it was back to tack, tack, tack. Eventually the tacks got a little longer, and then longer still and it was a case of identifying the finish line at Blackrock. It was a relief to furl the jib, drop the main and motor up to the pontoon at the Port of Cork, with kettle on, handing round the sandwiches. We had earned that cup of tea. As for the results: under the IRC handicap, Paul and Deirdre Tingle on Alpaca were first, Kieran Dorgan on Altair was second and Ria Lyden on Ellida was third, with five finishers in Class 1 out of 8 entrants. Under the ECHO handicap, Altair was first and Alpaca second. And for the record: on Winderfinder.com the report for Roches Point was 29 knots at 14.00 and 27 knots at 17.00. The report for Blackrock Castle showed 20 – 25knots gusting up to 37knots during the afternoon. More updates next week on activities in Keelboat racing in our club.